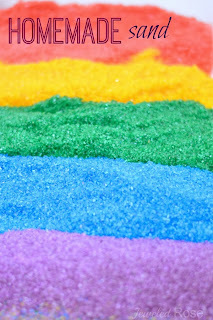 We bought a 25 pound bag of play sand from Home Depot last week, and we have been finding all sorts of NEW and FUN ways to play with it. 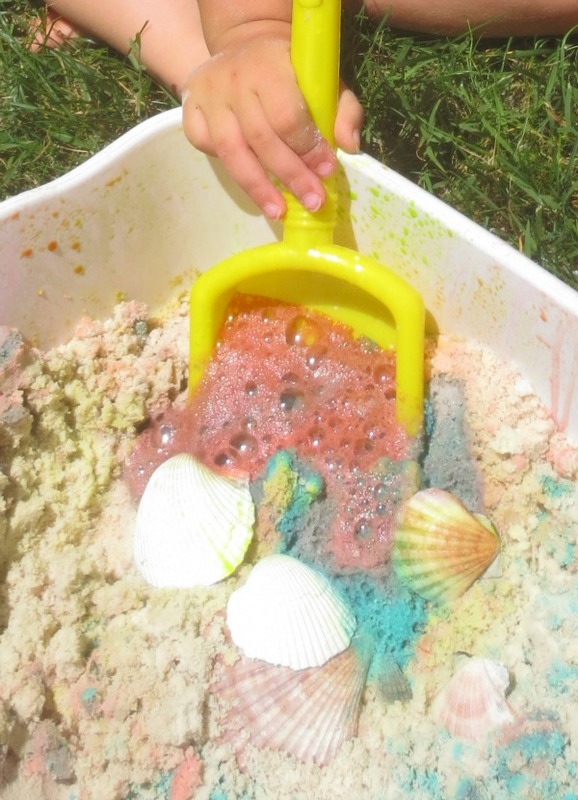 Yesterday we shared a homemade quicksand play recipe that the kids can really sink into this Summer. 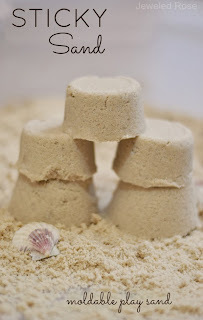 Today I am excited to share another sand play recipe. 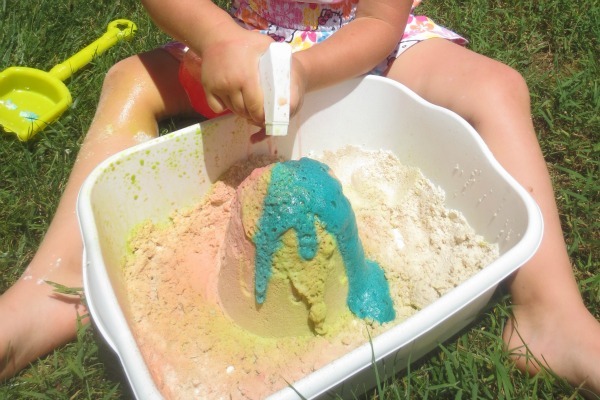 This homemade MAGIC Sand is really easy to make and SO FUN! We made our MAGIC sand very similar to how we made MAGIC Mud and MAGIC Snow. 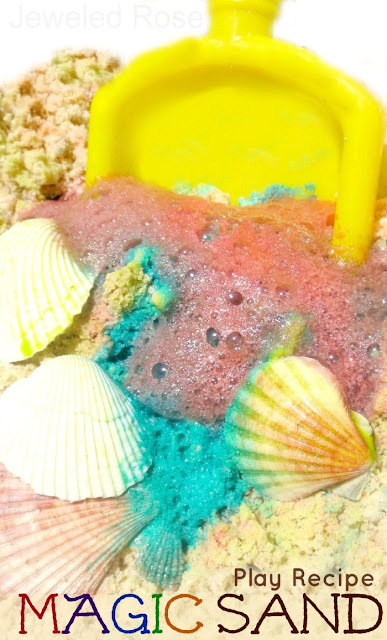 Making MAGIC Sand is very simple, and you don't even have to measure ingredients. 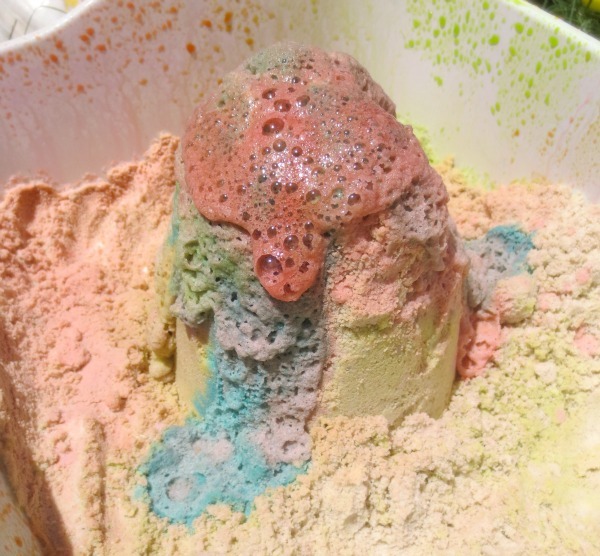 I filled a small container with play sand and added one large box of baking soda. You could use more or less of these dry ingredients. 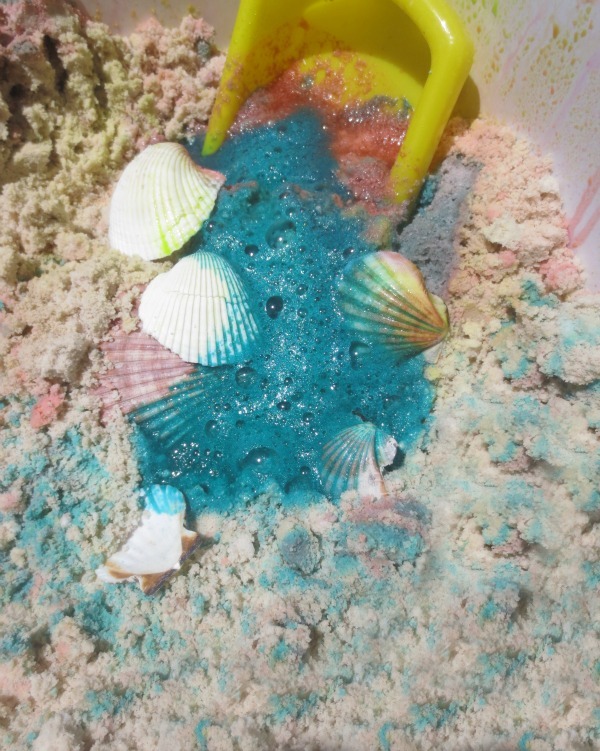 It doesn't take a ton of baking soda to make the sand MAGIC. Obviously the more you use the more magic it will be though. Rosie had lots of fun mixing the dry ingredients. Once the dry ingredients were good and mixed the sand looked like regular play sand. 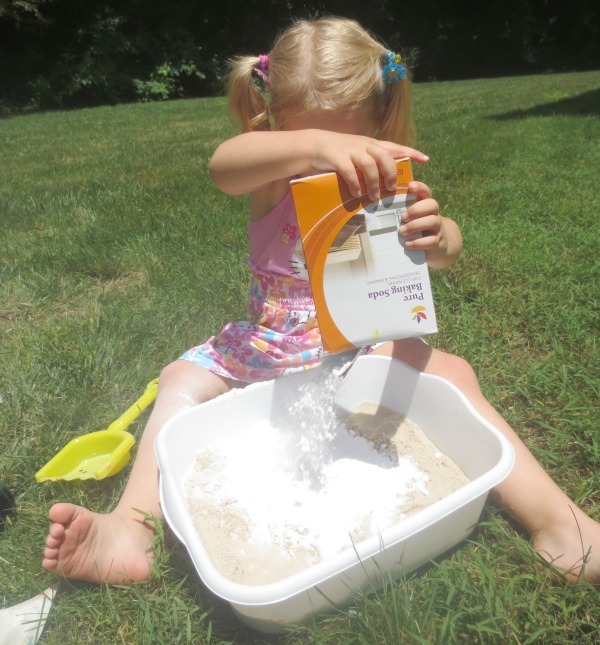 Rosie played and dug for a bit to really mix the baking soda into the sand. 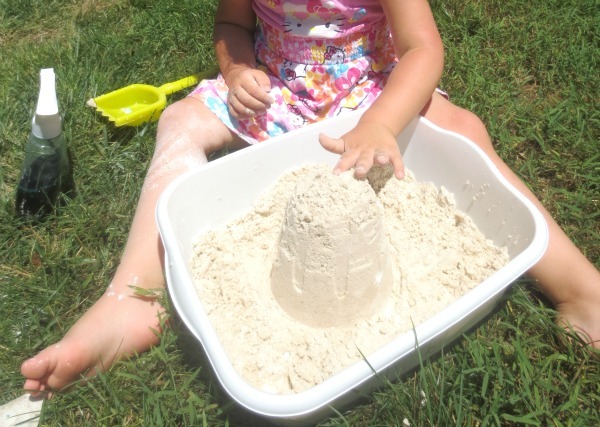 Then we added a very small amount of water to give us a mold-able sand so that we could make sandcastles and the like. You want to be sure to add the water slowly. If you add too much you will have more of a sand soup than a moist beach sand. Then it was time to make MAGIC! I filled three spray bottles with colored vinegar so that Rosie could paint her castles and make them FIZZ. We used washable liquid watercolors to color our vinegar but you could also use food coloring. I like that the watercolors are really vibrant and washable. If you use food coloring just be sure to add several drops to each bottle. I love how simple MAGIC sand is to make. 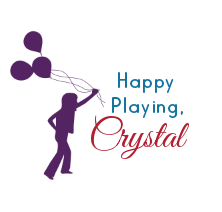 It is only good for one playtime, but it is so inexpensive to put together, it is well worth it and still very frugal. We got a 25 pound bag of play sand for $5 at Home Depot and only used a very small amount for this activity. 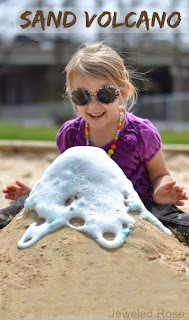 We still have TONS more fun sand activities on the way.......... connect with us so you don't miss them!